Over/Under: Under 169.0 at 1.90 Bet Now! 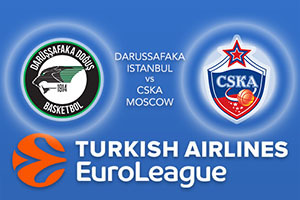 The 4-2 record of the home team is impressive and they are sitting well placed in the Euroleague but they know they face a very tough challenge on Wednesday night. This is because the away side in Istanbul on Wednesday is CSKA Moscow the only team with a 100% record so far this season. The reigning Euroleague champions have started the campaign in fantastic form and they will be looking for their seventh straight win in this game. The hosts earned their first home win of the season in Round 6, defeating Brose Bamberg, and this result will provide the Istanbul side with confidence going into this game. This confidence will be needed. One player not lacking in confidence for the home team is Brad Wanamaker, who has notched an average of 14.2 points per game this season for the Turkish side. If he can find top form on Wednesday night, his side will have a chance of obtaining a result in this very tough fixture. Adrien Moerman has provided an average of 6.8 rebounds per game this season, which is another statistic that the hosts will need to improve on if they are looking to have a chance in this clash. There isn’t a lot that can be said about the form of CSKA Moscow other than it has been relentless. You can barely improve on a 100% record but there is always scope for more from the team who are likely to be involved at the business end of the campaign. The last result was a one point victory but the 91-90 triumph over Real Madrid was a massive win and as usual, Nando De Colo was at the heart of it all. For the second time this Euroleague campaign, De Colo was the MVP, and he has achieved an average of 21.7 points per game so far this season. Milos Teodosic has also provided an average of 13.7 points per game this season and an average of 8.2 rebounds per game. These two players will likely make the difference in Istanbul on Wednesday. Look to take CSKA Moscow at -6 on offer at odds of 1.90. For the Over/Under market, look to go UNDER 169.0 which you can find at odds of 1.90. Bet Now!